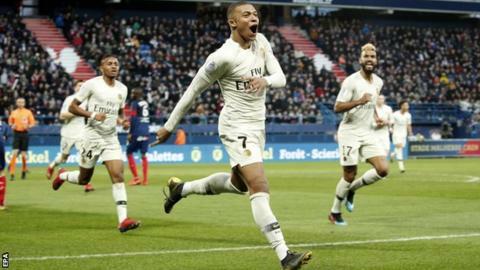 Kylian Mbappe scored twice as Paris St-Germain came from behind to beat Caen and move 20 points clear of second-placed Lille at the top of Ligue 1. Caen, 18th in the table, went in front on 56 minutes through Casimir Ninga. France striker Mbappe equalised from the spot three minutes later and then sealed the win in the 87th minute with his 24th league goal of the season. PSG host Manchester United in the Champions League last 16 on Wednesday, holding a 2-0 lead from the first leg. Evens Joseph (Caen) wins a free kick in the defensive half.